Christian worship has been held on this site since the 18th century. We believe we are the oldest still worshipping Methodist "society" in the world, having met since 1744. As well as the chapel our building also has a large hall & smaller rooms for hire. These are available for children`s parties & fund raising activities but alcohol is not permitted. At present, having played host to the congregation of St Michael and All Angels Parish church while their roof was being repaired, we are joining them on the first Sunday of each month. More informal Wesley Wednesday Worship is being introduced on alternate weeks from March 8th at 11.30am. This replaces Thursday coffee and praise and will run alongside the new Food for the Soul Café. Anyone is welcome to call in. 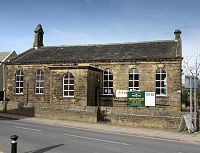 We are situated on the road to Stanbury in West Lane opposite the Old Sun Hotel and the building is a former Wesleyan day school so doesn`t look much like a church! West Lane is the road on the left hand side of the Tourist Information Centre in Main Street. Follow the road as it swings left & look out for the pub! As well as Sunday services we also continue to share worship occasionally with three other Methodist Churches in the Worth Valley. Our noticeboard will give details. Our current minister, Rev David McAloon, can be contacted on 01535 602669. Our building is well used by the local community with groups of all ages meeting virtually every day. From dog training to senior citizens we welcome all. Monday evenings see dog training courses for puppies & older animals (contact Kathryn Smith 01535 635290), Tuesday evenings see karate in the hall and the Fern Christian Fellowship in the church. Dance classes for six to 12 year-olds run from 5pm to 6pm. Contact Grace on 07787318384 for details. Wednesdays are our busiest day. They see a new Food for the Soul café from 10.30am where wholesome home-made food is offered on a pay-what-you-can arrangement. This is running alongside a new community library where people simply help themselves and has begun on a voluntary basis to replace the now defunct council mobile service. Haworth Senior Citizens meet the same afternoon for speakers and other activities. Every Wednesday evening Rainbows, Brownies and Guides meet in the large Grimshaw hall while alternate weeks welcome a new community choir at 6.30pm in the chapel. Contact Charlotte Jones on 07805039446 or charlottejonessinger.com for information. Thursday evenings again host karate. A Well Being Cafe runs bi-monthly on 3rd Fridays between 1.30pm and 4pm. This is for older people and their carers and involves food, entertainment and information. Other groups come and go, making bookings as they need them. The hall is also available for meetings, fund raising activities or for children`s parties, being large enough for a bouncy castle. Many Haworth people have links with us even though no longer regular attenders, and all are assured of a warm welcome not just to special occasions. Details of our activities are on the noticeboard in the yard opposite the Old Sun pub. We also have two graveyards with monuments dating back more than 200 years. The upkeep is difficult for the small congregation of older people and the graves are still in the ownership of individual families though few try to maintain them. For safety reasons access to the top graveyard is limited only to people wishing to tend graves.